There is already technology that will can save your phone’s location if its battery dies or can send text messages after the power has gone, but what if you could buy a phone that never lost power again because it was permanently on charge? It sounds too good to be true but that’s the idea behind a revolutionary technology called Wysips that converts energy from both artificial light and sunshine into electricity that can be used to keep your mobile alive. It uses light-collecting crystals that can be fitted beneath or on top of the screens of phones, tablets and even smartwatches, and early prototypes have been able to convert 10 minutes of light exposure into four minutes of extra battery life. French manufacturer SunPartner Group is working on extending this conversion rate and has now signed a deal that will see the technology used in future handsets. SunPartner specialises in solar NETs (New Energy Technologies) and Wysips stands for What You See Is Photovoltaic Surface. Photovoltaic technology converts solar radiation into electricity and semiconductors. SunPartner bonds a thin layer of photovoltaic material onto a network of micro-lenses to produce a thin, transparent sheet. 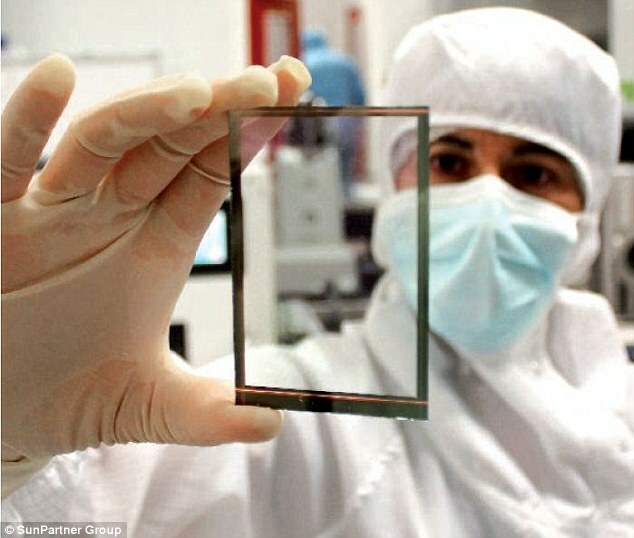 The technology can also be adapted to other screens and windows, and the makers believe they can turn any surface into an energy source. The Wysips crystal component is 90 per cent transparent, according to industry standards, and is said to be invisible to the naked eye. SunPartner claim the sheet does not impact on the phone’s contrast, readability, angle of view or luminosity. It works by transforming light energy into electric power that is directed back into the phone’s charging circuit, as if it were plugged into the grid or connected to a USB port. The power from early versions of the component reaches 2.5 mW/ cm2 when exposed to sunlight, which gives between two and four extra minutes of communication time for every 10 minutes the phone is exposed to the light source. SunPartner also add that products fitted with a sheet of 60-70 per cent transparency can generate power of up to 10 mW/ cm2 – around 16 minutes of extra life for every 10 minutes of exposure. Last month, SunPartner and smartphone maker TCL Communications announced they were developing smartphone prototypes powered by light, which could include Alcatel One Touch phones. The first prototypes are expected to be ready by 2014. The component is installed during the manufacturing process and is connected to an electronic chip that converts and manages the electricity produced. Wysips technology could also be used to widen the viewing angle on small-screened devices. ← Want A Promotion? Start Dressing Like Your Boss!